The Ellanyze Wonder Woman Entrepreneur Interview Series features badass women business owners changing the world for good one day at a time. What does it take to run a successful business? According to Emily McGuire, the founder of a thriving email marketing business in Ann Arbor, Michigan Flourish and Grit, hard work, ignoring self doubt – and a whole lotta coffee. Enjoy this debut interview from Ellanyze featuring Wonder Women Entrepreneurs! In early 2018, but I’ve been a digital marketer for over 5 years. Helping hustlers. The people I work with are often either the sole-doer for their company or their marketing department. I can’t tell you how many times I’ve ended a meeting with someone and they let out a sigh of relief. Walking into e-mail marketing blind or with a million marketing projects already on your plate can be overwhelming. It’s a delight to feel like I’m helping take something off someone’s plate and take it to the next level. What’s your favorite client success story to date? I redesigned and tested a client’s welcome email. The new design increased clicks 113% and orders and revenue went up 36%. It’s rare to get to see how tweaks impact sales performance, but I get to see results with e-mail. What gift do you believe you ultimate give your customers? It’s weird to say this as a marketer, but I reduce stress. I take an overwhelming problem and I resolve it while letting hustlers focus on what they love to do. In addition to sending out e-mails that generate sales, I also automate customer data collection and messaging so that leads can be targeted better. I love organizing data and working smarter, not harder. Not everyone is into data which makes me more useful to people who need it. What’s a typical day in Emily’s life? It usually starts with chasing my toddler around the house to get him ready for daycare. Then, coffee. Lots of coffee. I’ve been reading The Artist’s Way which has an exercise for journalling 3 pages in the morning. I try to start my day with that when I settle into my home office. It’s refreshing to mind dump before the hectic day starts. Then, it’s off the races – reviewing my calendar/bullet journal, tackling all of the projects, and meetings, meetings, meetings. Basically, I think I need a part-time job to support my expensive coffee habit. What advice do you have for people new to the entrepreneurial world trying to make their business dream a reality? I’m an introvert, so I’ve always had this problem, but I’ve been working on it extra hard since starting my business. It’s scary, and I tend to overthink it. I’ve been working on ignoring that anxious voice in my head that loves to self-doubt. Eventually, you just have to leap and be terrified while doing it. It will easier. If you could start all over again, would you do anything differently? No. It’s all a learning process. Sometimes, I have the tendency to focus on the failures and interpret something negative from them. In the long run, they teach me something, and I need to listen to the failures for their lessons and try better next time. 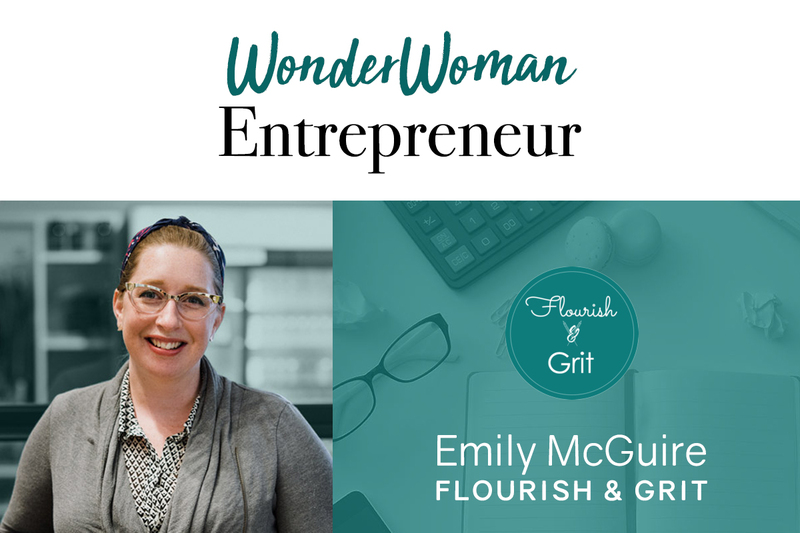 For more about Flourish & Grit and how Emily can help you take your business to the next level with email marketing, visit the Flourish and Grit website. Interested in more reading on email marketing? Check out 10 Tips For a Great Newsletter from the Ellanyze blog.